This article first appeared in Personal Wealth, The Edge Malaysia Weekly, on June 4, 2018 - June 10, 2018. As the world transitions into a low-carbon economy, investors can no longer ignore the impact of climate-related risks on their portfolios. These risks can negatively affect companies and industries in terms of their operations and the demand for their products and services. Yet, little is known about the extent of carbon risk in portfolios, says Jon Hale, Morningstar Inc’s director of sustainability research. Carbon risk, defined as the material financial risk businesses face from having to lower their carbon emissions, allows investors to evaluate the impact of their investment decisions on their portfolios. Most efforts to measure carbon risks in portfolios rely on a method called carbon footprinting, which is calculated by estimating greenhouse gas emissions. But it has limitations as the emissions data provided by the companies can be incomplete, inaccurate or not independently verified, says Hale. So, in addition to assessing the greenhouse gas emissions of companies, the investment research firm introduced the Morningstar Portfolio Carbon Risk Score. The new set of metrics analyses how companies deal with the exposure. This enables investors to monitor, manage and reduce risks stemming from carbon exposure on their portfolios. Hale says the score reveals how vulnerable a company is to the transition towards a lower-carbon economy from a fossil fuel-based one. With the Carbon Risk Score, investors are better equipped to analyse and evaluate their portfolio exposure to ensure that they meet the realities of a carbon-constrained future. 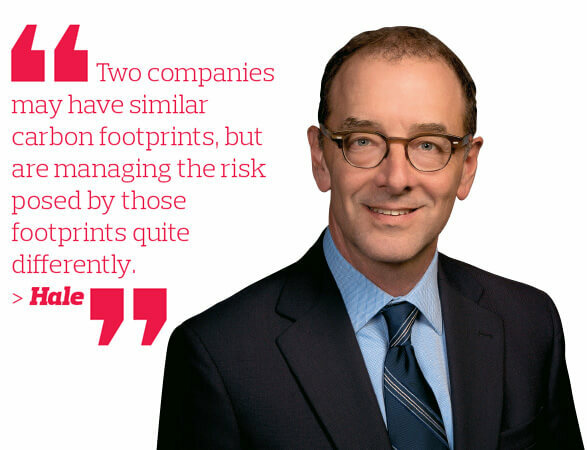 “The carbon risk score not only provides comparable information across funds globally but the risk measure itself is an advance from carbon footprinting, which has been the main way investors have tried to assess carbon risk until now,” says Hale in an email interview. “Two companies may have similar carbon footprints, but are managing the risk posed by those footprints quite differently,” he points out. Since the 2015 United Nations Climate Change Conference in Paris, some of the world’s largest countries and global energy giants have pledged to cut carbon emissions to limit the increase of global warming to less than 2°C. Part of the agreement is to ensure capital flows are in line with the target as climate change is recognised as a “systemic risk” to financial systems and the ambitious goal requires significant investments to back renewable energy, smart grids and energy-efficient storage systems. Hale points out that understanding carbon risk in a portfolio can help investors make better decisions. “Investors typically do not know the extent to which a portfolio is exposed to carbon risk. While a portfolio’s exposure to fossil fuel is a major component of its carbon risk, a much wider range of industries — approaching half the overall market capitalisation by some estimates — have exposure to carbon risk through trends such as the shift to renewables or electric vehicles,” he says. The carbon-risk assessment applies to asset managers as well as asset owners and fund investors, says Morningstar. “An asset manager can use carbon-risk information to inform their buy/sell and portfolio-construction decisions, to make decisions on which companies to engage with to better understand their climate-risk mitigation strategies, and to communicate about their activities with clients and other stakeholders,” says Hale. How is the Carbon Risk Score different from existing environmental, social and governance (ESG) filters that Morningstar uses in rating funds? Hale says the Morningstar Sustainability Rating is based on data provided by Sustainalytics — an independent provider of ESG ratings and research, which includes the assessment of companies’ carbon exposure and management. It is part of a broader evaluation of the companies’ exposure to and management of overall ESG risks and opportunities. “Company-level ESG scores are calculated within industries and reflect ‘best-in-class’ comparisons. The fund-level Sustainability Rating is assigned relative to a fund’s category,” he says. The Carbon Risk Score has been applied to about 30,000 funds globally since April. The scores range from low to high, with a lower score suggesting a lower risk of carbon exposure within a portfolio. “The scores will give investors a better understanding of the carbon risk in funds by investment style and region and a better understanding of the range of carbon risk among portfolios that share an investment style or region,” says Hale. The score is based on company-level carbon risk assessments from Sustainalytics. Hale says the score was developed as investors have been asking for a set of metrics that moves beyond carbon footprinting to a closer assessment of the actual risks posed by a company’s carbon emissions in the transition to a low-carbon economy. Basically, companies with scores of less than 10 are considered to have low levels of unmanaged carbon risk that could have some material impact on company value. “At the other end of the scale, companies with scores from 30 to 49.99 have high carbon risk while those at 50 or above carry severe carbon risk,” says Hale. 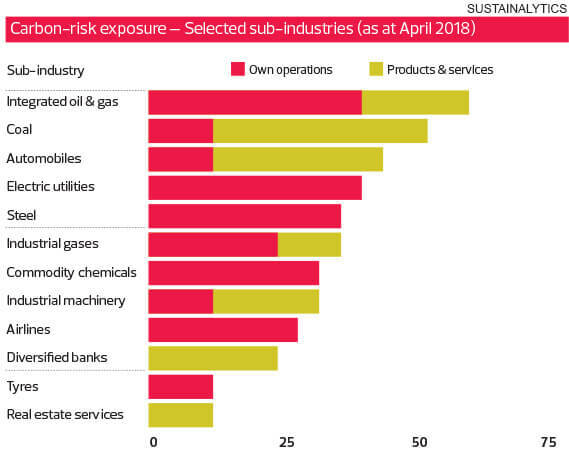 “Companies with high and severe carbon risk are those for whom transition risk poses a more serious financial threat that may lead to significant underperformance relative to the overall market or that may even be existential in nature. A portfolio with a lower Carbon Risk Score is positioned to fare better in the transition to a low-carbon economy than a portfolio with a higher Carbon Risk Score,” he adds. 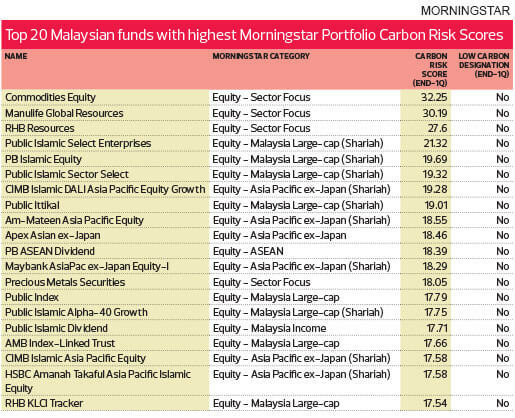 Morningstar calculates the Carbon Risk Score based on the recent portfolios in its database. The score can be used to compare funds with each other, with their Morningstar Category average and with their benchmarks. “Because funds will receive Carbon Risk Scores on a quarterly basis going forward and will receive 12-month average scores, it will be possible to evaluate change over time and the extent to which portfolio managers are addressing carbon risk,” says the investment research firm. By region, funds investing in the US and Europe (excluding the UK) have the lowest average carbon risk while those investing in Asia ex-Japan and emerging markets have the highest average carbon risk. “Most categories of diversified funds, however, have low-carbon fund choices regardless of their average risk levels. 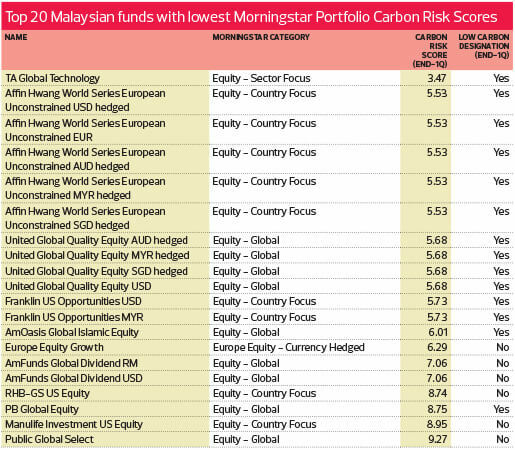 Investors can use the Morningstar Portfolio Carbon Risk Score and the Morningstar Low Carbon Designation to identify such funds. Investors can now incorporate carbon risk into their due diligence process alongside traditional investment criteria,” says the firm. To qualify to be scored, funds must have at least 67% (two-thirds) of their assets invested in companies that have Sustainalytics’ carbon-risk ratings, says Hale. Of the 30,000 funds, the 130 domiciled in Malaysia have been given the Carbon Risk Score. “Globally, the energy sector has the highest carbon risk, followed by utilities, industrials and materials. Technology and healthcare are the sectors with the lowest carbon risk,” he adds. Portfolios that show low carbon risk and exposure to fossil fuel will receive the Morningstar Low Carbon Designation, which is represented by a green leaf icon. “The icon is meant to help investors quickly and easily identify low-carbon funds and, in general, to educate key stakeholders and the public about the availability of low-carbon investment choices. For a fund to receive the Low Carbon Designation, it must have a Morningstar Portfolio Carbon Risk Score of less than 10 and fossil-fuel exposure of less than 7% for the trailing 12 months,” says Hale.